When you bring your car for an MOT or service at Duffy Motors, you’ll need to leave your car with us for at least an hour before you can get on your way. Fortunately, because Duffy Motors is a city centre garage, there are lots of things that you can do to pass the time in Manchester. There are a lot of great coffee shops within a five or ten-minute walk from the garage. We’ve picked some of our favourites below. 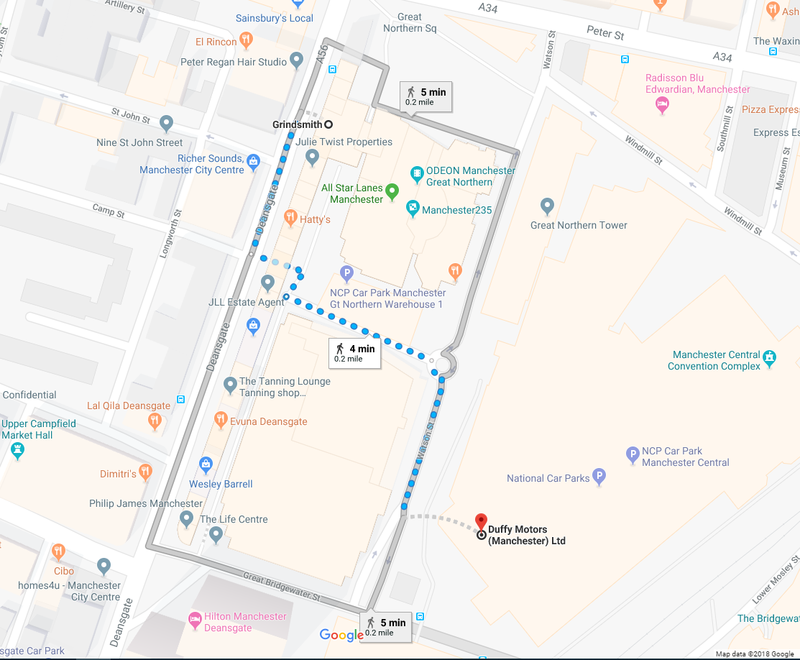 We’re based off Deansgate, just around the back of the Beetham Tower, and it’s easy to get here by car. To make things easy, many of our customers who work in the city centre like to drop their car off in the morning, before walking or taking public transport to work and picking the car up on the way home. There are lots of great transport links from Duffy Motors and we have the space to store your car free of charge. ManCoCo is an artisan micro coffee roaster that imports and roasts all their own coffee. It’s one of the top-reviewed coffee shops in the city – with a lot of reviewers describing it as the best coffee they’ve ever had. You’ll find their small coffee shop in a railway arch just like ours. It’s just around the corner on Hewitt Street so you’ll have no trouble finding it. Happy to announce that all of our takeaway cups are now 100% compostable and biodegradable! They’re so good for the environment, even origami rabbits love them! Grindsmith is our city centre garage’s closest coffee spot. You’ll find it on Deansgate, just on the other side of the Great Northern Warehouse and the coffee and food is well worth the trip. The shop also shares the building with a co-working space and a start-up incubator, so you can rub shoulders with some business elites and get some work done. Located on the 23rd floor of the imposing Beetham Tower, Cloud 23 is the place to enjoy a brew with a view. If you prefer tea to coffee then is the place to go. There’s an afternoon tea deal with snacks, cakes and even champagne. It’s a little bit on the expensive side, but you can often find discount vouchers on Groupon. Whatever you’re celebrating this summer – graduations, birthdays, great sporting victories…we’ve got you covered! Try our ‘Les Trois Bulles’ flight of Champagne cocktails, or book in for our premium Champagne afternoon tea – Alpha Tea. Located just down Deansgate in the Grade II listed Barton Arcade, the brilliantly light and airy Pot Kettle Black makes coffee for people who really appreciate good coffee. They’ve just recently opened a second mini-outlet on the bottom floor of the imposing No.1 Spinningfields tower that’s even closer to Duffy’s city centre garage. The Best #Hidden #Coffee Shops In #Manchester@PKBcoffee found in the Barton Arcade is nicely tucked away and a great insight as to what a coffee shop ran by two #rugby players would look like. A pleasant and lively café located just on the approach to Manchester Oxford Road train station. Serving up delicious cakes and coffee made from the finest produce, this place is perfect if you want to grab a quick bite or refreshment before catching a train on to work. And the outside seating area is great for people watching.